Install a floor that balances resilience, good looks, and value pricing by choosing laminate flooring for your renovation project. Few flooring choices can rival the affordability, durability, and versatility that laminate offers. When you need a budget-friendly way to refresh a bland room while catering to your sense of style, shop our selection of laminate. Whether you are browsing our inventory online or exploring our showroom, our staff members are always on-hand to help you find the perfect laminate product for your needs. Numerous laminate wood flooring and laminate tile flooring options are available from some of our nation’s top brands. With so many different laminate floors to choose from, you are certain to find something that coordinates with your interior design and fits your price range. If you are not sure what kind of flooring would best suit your home’s style, we can help. Our staff members utilize their design knowledge and flooring expertise to make insightful recommendations. In addition, several displays are set up throughout our showroom for design inspiration. Once you’ve chosen the ideal pattern and style for the room, let our laminate flooring installation experts take over. Laminate floor products are specifically made to be easy and quick to install, so you can refresh your room fast. Visit us soon to take advantage of our wide selection of products everyday competitive pricing. Achieve a luxurious look at a low price with laminate wood flooring. 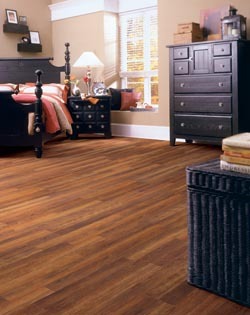 If you love the look of hardwood but cannot commit to the price, laminate is a great compromise. You can save hundreds of dollars—or even thousands—by choosing a laminate wood floor over a hardwood one. This is what has made laminate wood floors a favorite among budget-conscious shoppers for years. Thanks to its special construction, laminate can imitate almost any style of hardwood flooring at a fraction of the price, including pine, maple, cherry, and oak. Regardless of what wood species, stain, or finish you prefer for your flooring, there is a laminate option for you. Learn more about the benefits of laminate wood flooring and find out what styles are currently available by speaking with our showroom staff. Many people admire the natural beauty of tile flooring, but cannot find room for it in their renovation budget. If you find yourself in such a situation, we recommend laminate tile flooring. This product mimics the appearance of tile at a fraction of the typical cost. The potential of laminate tile floors are nearly limitless. You can find styles that replicate the look of ceramic, porcelain, stone, and other materials. Pay a visit to our massive showroom to see all our beautiful options and discover how much you can save. Our staff members are always standing by and ready to help if you have any questions about laminate tile flooring. No matter what room you are renovating, laminate is a great choice, especially if you want a low-maintenance flooring option. Laminate floors are perfect for busy households because they do not require much care. Not only is laminate highly resistant to scratches and stains, it is also easy to keep clean. Sweeping laminate every regularly, along with routine mopping, ensures the floors look good even under heavy use. Laminate flooring is especially appropriate for the kitchen because properly sealed laminate doesn’t absorb water. If something is spilled on the floor, simply use a sponge to clean it up without worrying about water damage. To ensure we have a floor for any décor taste, our showroom’s inventory and displays are updated every season with the latest looks. By continuously adding to our selection, we ensure that we always have laminate flooring that fits the aesthetics of modern homes. Furthermore, our store maintains a diverse stock of traditional styles. This means that no matter what kind of look you prefer, we have something for you at a price you will love. Laminate floors are created from layers of fiberboard and composite woods that are compressed together under high heat. This durable core is then overlaid with a “photograph layer,” an image or pattern that is printed on the product. This is what allows the flooring to effectively simulate hardwood, natural stone, or even ceramic patterns. It is then well-sealed with resin and a moisture guard, preserving your flooring’s appearance and structure integrity. Thanks to this special construction, any laminate flooring that is properly installed is sure to stand up well to years of high foot traffic. A distinct advantage of laminate flooring options is the speed of installation. A laminate floor can often be installed in half the time of other flooring. That’s because the process uses a special “click-lock” system. This is usually a tongue and groove method that allows every piece to easily connect with other pieces like a puzzle, which rapidly increases the speed of laminate flooring installation. In addition, many brands of laminate come with dry glue pre-applied. Once our expert installers wet the glue, the laminate is affixed to the floor and the installation is complete. A distinct advantage of laminate flooring options is the speed of installation. A laminate floor can often be installed in half the time of other flooring. That’s because the process uses a special “click-lock” system. This is usually a tongue and groove method that allows every piece to easily connect with other pieces like a puzzle, which rapidly increases the speed of laminate flooring installation. In addition, many brands of laminate come with dry glue pre-applied. Once our expert installers wet the glue, the laminate is affixed to the floor and the installation is complete. To enjoy your new floor as soon as possible, utilize our store’s affordable installation services. Instead of using up your precious time and energy, you can hire our certified installers to do it for you at a reduced price rate. Our contractors are specially trained to handle each product we sell, so you can rest assured that your laminate flooring installation will be done right. In fact, if you ever have any issues with your new floor, we will replace it for you at no charge under our Ultimate Confidence Guarantee. For detailed information on this guarantee, speak with our showroom staff. Contact us to find out more about our wide selection of top-quality and affordable laminate floors. We proudly serve customers in Longmont, Colorado, as well as Niwot, Frederick, Firestone, Louisville, and the surrounding areas.